Public concern about Hong Kong’s air pollution and its affects on public health has been growing for many years. Yet until 2008 the only information available to the public was the Air Pollution Index (API), which gave a daily reading for pollution with the weather report. However the API provided no information about the possible health impacts of air pollution, and the public had no other source on which to draw. The World Health Organization (WHO) has determined a level for air that is safe to breathe, known as the Air Quality Guidelines (AQG). These levels were set by the leading experts on the public health impacts of air pollution, and included Professor Anthony Hedley, Chair of Community Medicine at the School of Public Health at Hong Kong University (SPH HKU). Hong Kong’s Air Quality Objectives (AQOs) were established in 1987, at the same time as the WHO AQG. However, unlike the global standard, Hong Kong’s AQOs have never been updated. As a result, Hong Kong’s air quality lags far behind other cities with a comparable level of economic and social development. It was not until 2006 that the Hong Kong SAR Government announced an 18-month review and consultation to set new AQOs. This process has taken longer than expected, and the new AQOs will not be announced until 2010. In order to communicate to the public the underlying health risks caused by existing levels of air pollution, Civic Exchange worked with Professor Hedley’s team at SPH HKU to launch the Hedley Environmental Index (the Index). The project began in June 2008 and will end in August 2009. We are grateful to the Fu Tak Iam Foundation Limited for their generous support in funding the creation of the Index. 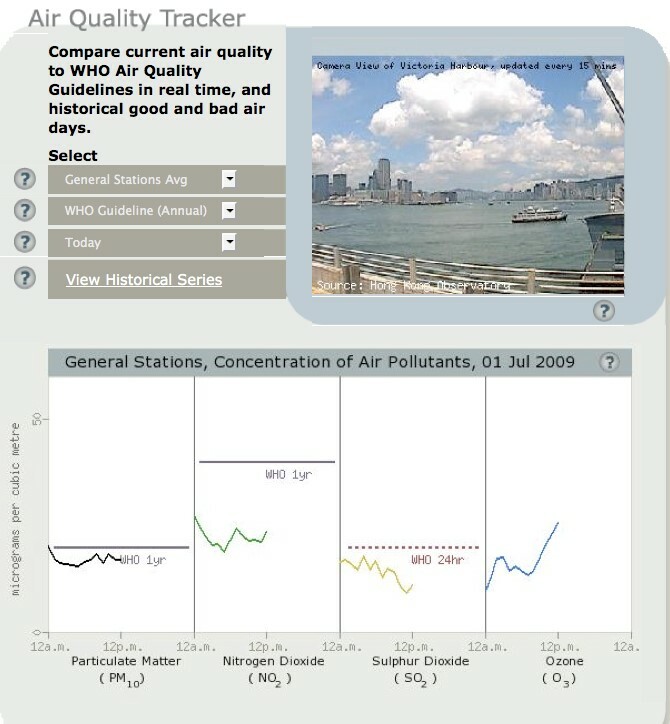 Named in honor of Professor Hedley, who has worked air-related health issues in Hong Kong and Southern China for many years, the Index is the world’s first web-based tool to monitor the real-time health impacts of air pollution. Since its launch in December 2008, the Index has already been used to raise public awareness of the health impacts of Hong Kong’s pollution through its launch and demonstration at a press conference at SPH HKU, and subsequently at Civic Exchange’s conference on air pollution; “The Air We Breathe – a Public Health Dialogue”, which has held on 10th January, 2009. 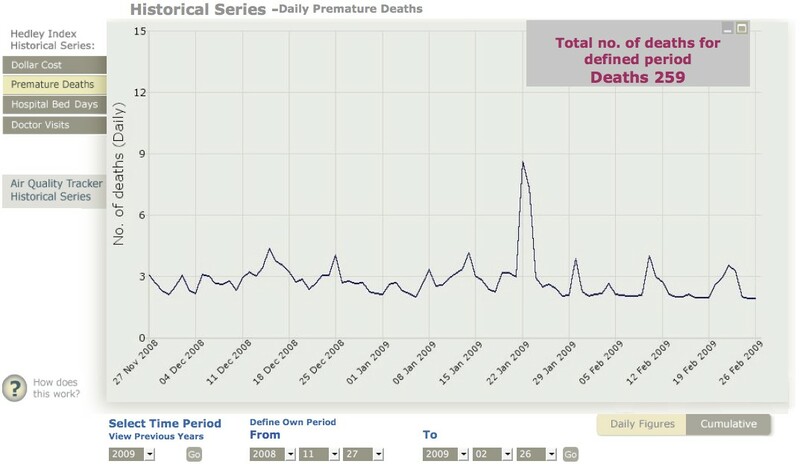 Since then the Index has also been used to highlight days of exceptionally high air pollution for the media. But perhaps most significantly, Professor Hedley’s team was able to use the Index to calculate the likely health impacts of the new AQOs. The conclusions drawn suggest that if implemented as proposed, our air pollution, and the related health impacts, could legally increase beyond the very high levels we all currently endure! The Index has two objectives, both of which were met when the Index went live on 18th December 2008. 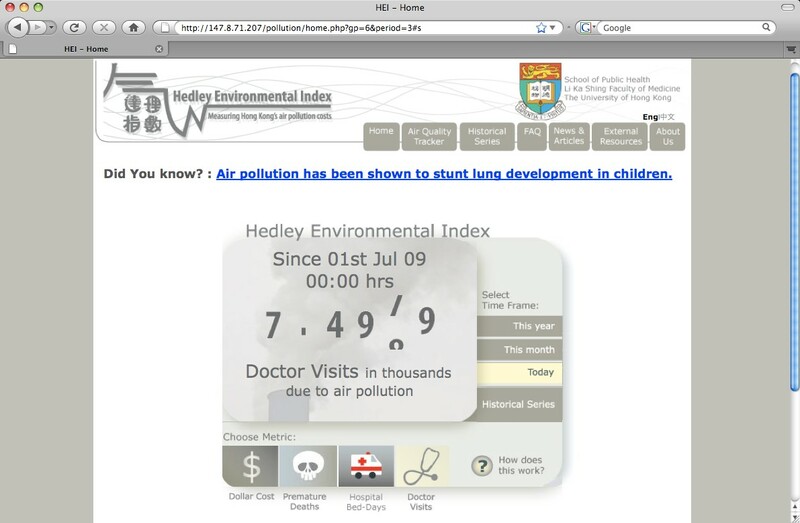 Hedley Environmental Index homepage. The clock is set for doctor visits on a given day. A metric for the number of avoidable hospital admissions caused by asthma, a complaint that is increasingly widespread in Hong Kong. An additional dollar cost – for intangible costs – will be offered as a supplement to the current figure, which represents tangible costs. The intangible costs are approximately ten times higher than the tangible costs, which currently run at over HK$2.3 billion per year. Second, The Air Quality Tracker plots the real-time concentrations of four important air pollutants: particulate matter (PM10), nitrogen dioxide (NO2), sulphur dioxide (SO2) and ozone (O3) against the WHO AQG. The data comes from the Environmental Protection Department (EPD). This Tracker also gives a view of Victoria Harbour from a Hong Kong Observatory web cam, providing a direct link between the numbers and what you can see if you look out of the window. The Air Quality Tracker shows the real-time levels of four pollutants, and a web cam view. As with the clock, the Air Quality Tracker offers a variety of choices for viewing data. The Air Quality Tracker also offers users the option to see average emissions at the roadside stations, where pollution is always higher, and the readings for each of the 14 individual monitoring stations in EPD’s network. 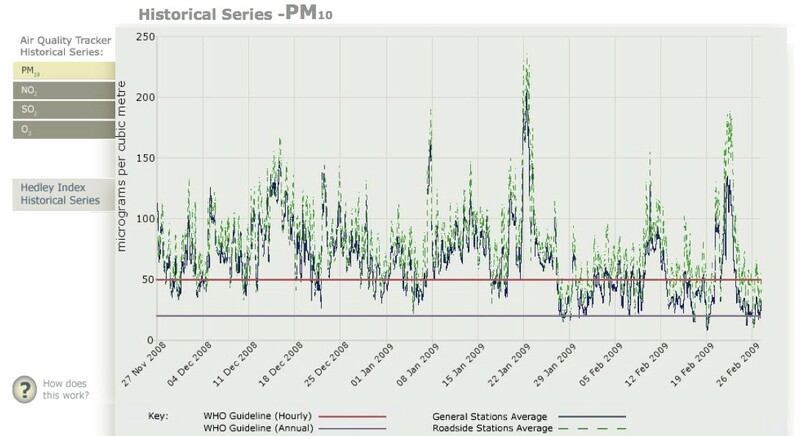 The very high levels of PM10 occurs on 22-23 January. It demonstrates how the high pollution at that time lead to an increase in the number of avoidable deaths per day from about three to almost nine. While the Index was designed as a scientifically robust research tool that would meet the exacting requirements of the academic world, it was always intended that the information would be accessible to a much wider audience, including the Hong Kong Government and the public. Web traffic records show that approximately 10,000 people visit the website every month, while inputting the keywords “Hedley Environmental Index” or “Hedley Index” into Google collectively shows 400,000 entries by July 2009.The general comments of users indicate that they find this Index very useful, particularly when they wish to understand daily air pollution levels around their personal locations in Hong Kong. The Index has been used to provide the media with information on days with particularly high levels of pollution. It has also been used to present the issue of air pollution to school children, and Civic Exchange is currently exploring opportunities to include air pollution in the school curriculum, and to make the Index a key component. Perhaps the most important application of the Index is its use as a tool to measure the likely health impacts of the new AQOs proposed by the Government. In particular, the new AQO currently proposed for sulphur dioxide emissions is some five times greater than the current average level! Using the Index, SPH HKU is able to demonstrate not only the health impacts of the current daily levels of sulphur dioxide pollution, but can also use it to show how these impacts would change if pollution levels reached the proposed targets, which, under law, they could do. SPH HKU has submitted a series of documents to the Government pointing out the serious health risks should the new AQOs be adopted. SPH HKU is planning to promote the Index to all schoolchildren in Hong Kong in a 2-years Health Promotion Fund project. The Index will be transformed so that it can be more easily understood and used by schoolchildren. The aim is to evaluate students’ knowledge, perceptions, commitment and attitudes towards air pollution before and after they access the Index. It is expected that early education will help to change the public’s expectations on air quality, as well as changing the attitude and perceptions of parents. SPH HKU will also continue to seek funding to facilitate further research on the effects of air pollution on the health of Hong Kong’s schoolchildren.